The company wants to stop the practice of asking for customer reviews on its site, and third-party sites as well. Yelp is, of course, just one of a number of online directories and search sites that feature consumer reviews. Google, Facebook, TripAdvisor, OpenTable, Amazon and various others also encourage and publish consumer reviews. 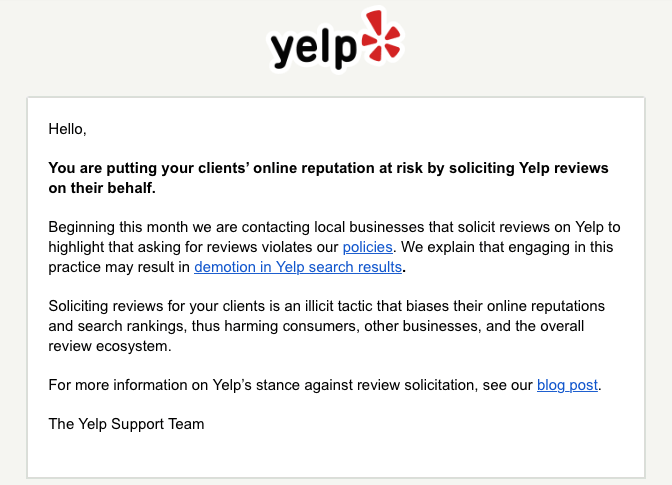 Yelp, however, has the strongest (some would argue “most extreme”) policies against what it calls “review solicitation” — asking for reviews in any form. Yelp has historically taken a hard line against this behavior to preserve user confidence and the integrity of its content. If people doubt the veracity or authenticity of consumer reviews on Yelp, usage could decline, and so would the company’s value. Reviews are most valuable when they are honest and unbiased. If you own or work at a place, please don’t review your own business or employer. Don’t offer or accept money, products, or services to write reviews for a business or to write negative reviews about a competitor. If you’re a business owner, don’t set up review stations or kiosks at your place of business just to ask for reviews written at your place of business. Google’s Local Guides program “incentivizes” its members to provide reviews and other content with points and prizes. This is Google itself encouraging participation, not the individual business owners. And Yelp asks users to write reviews (i.e., “your next Yelp review awaits”). Don’t ever offer freebies, discounts, or payment in exchange for reviews — it will turn off savvy consumers, and may also be illegal. Yelp has a Consumer Alerts program to let people know about businesses that engage in this sort of activity. With the phrase “don’t ask,” Yelp goes further than others. It also advises business owners not to work with third-party review solicitation vendors. The question is how broadly the company is defining that phrase. More recently, Yelp has also sought to prevent partners and those using its API from soliciting reviews on sites other than Yelp. The company explained in an email to me recently that if a “partner or API user” is soliciting reviews “on Yelp or other platforms,” the company will try to persuade the partner to stop, but if unsuccessful, will potentially discontinue API access or the relationship. While some of the companies seeking to help business owners obtain reviews are unethical, others are trying to address a small business pain point in the market. Their only way to continue operating, it would appear, is to discontinue any practice that looks at all like asking for reviews on Yelp. Postscript: Reputation management company NiceJob was the source of the email notice above.